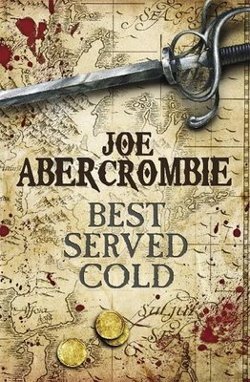 review Joe Abercrombie’s new stand-alone novel Best Served Cold is a light-on-magic and heavy-on-swords blood-soaked revenge quest that will highly satisfy fantasy fans with a black sense of humour and a taste for gritty and violent prose. The book’s clever pacing, frequent plot twists and likeable (or hilariously despicable) characters will leave many readers unable to put it down. It’s especially recommended to George R. R. Martin fans, who will find the cruel hoops that Abercrombie’s characters are forced through, and the chapter by chapter pacing, reminiscent of the fantasy master’s epic A Song of Ice and Fire. Set in the world of Abercrombie’s previous The First Law Trilogy, and with links here and there to it, Best Served Cold can nevertheless be read as a pure stand-alone novel. There are two lead characters in Best Served Cold, although at various times the reader follows the viewpoint of a minor lead. The first, Monzcarro Murcatto, is one of those rare beasts; a female mercenary, and a good one. Along with her brother, General Murcatto has risen to the top of the mercenary world; she leads the Thousand Swords and has led the mercenary band’s employer, Grand Duke Orso of Talins, to the brink of taking over most of the country the book is set in, Styria. Styria is a country not unlike Machiavelli’s 15th and 16th century Italy, dominated by warring city-states. Plagued by several decades of conflict, everyone has their price in Styria, and there’s plenty of buying and selling going on. In this bloody world Murcatto is a master of making war for profit — sometimes at the expense of her friends and mentors. Then one day, the reign of ‘the Snake of Talins’ over Styria’s battlefields comes to an end as she is betrayed in the most cruel fashion by her employers. Broken, left for dead and thrown down a mountain into a pile of trash … it’s the perfect set-up for Murcatto to spend the rest of the book’s 534 pages getting a little of her own back … in style. Enter Caul Shivers, a warrior from the northern climes. Down on his luck in Styria, Shivers is nevertheless a fighter of honour, trying to be a better man after his crimes of the past. Sadly enough, Murcatto recruits him to assist with her vengeance. The Northlander initially makes a perfect foil for Murcatto, as we view her revenge quest — and the rogue’s gallery of character she recruits to pursue it — through his more rational eyes. But of course Abercrombie is not naïive, and neither Murcatto or Shivers are one dimensional characters. Revenge is often not as simple as it seems just after we’ve been betrayed, and so the plot and characters of Best Served Cold are not that simple either. Murcatto is not black, and Shivers is not her white opposite. Best Served Cold is a novel of the grey areas of morality. One of the best things about Best Served Cold is the pacing. Like GRRM, Abercrombie often throws the reader a curveball at the end of his chapters, using a small plot twist and repetitive phrasing to create irony after reading the earlier portion of the chapter. Bigger curveballs come at the end of each major, labelled, sub-section of the book. At these points characters’ loyalties often change, and major plot twists are revealed that drive character development and reveal character history. Because of this structure, the whole book works very well as a stand-alone novel. Just as you’re getting tired of the character and plot setup that Abercrombie has devised, it changes, generally in a most unexpected way (although there are clues, and I successfully predicted several twists). Just as you’ve been sucked into believing you can predict what is going to happen next, you’ll likely get sucked-punched by this extremely intelligent author. In many ways, the decision to pursue Best Served Cold as a stand-alone novel rather than the series it could easily have been was a very smart one for Abercrombie, although it also has its disadvantages. The author’s previous work was split into three in The First Law trilogy. The advantage to this approach, and Abercrombie’s stand-alone format, is that it allows him to reel in the reader quicker and provide them with a heightened level of entertainment that doesn’t get stale easily. Best Served Cold is chock-full of action, like a good heist movie. It also means the reader is not left hanging at the end of the book, waiting for a sequel that could be years away. Best Served Cold gives readers more of what they want, quicker. However it also means Abercrombie is forced to eschew the sort of deep, underlying plot arcs that are very gradually revealed in series like Janny Wurts’ The Wars of Light and Shadow and Robin Hobb’s Realm of the Elderlings. These are the sort of plot arcs that drive long-term, reader addiction and create a huge fan base. I’d like to see Abercrombie pursue a much longer series now that he’s been “blooded” in the publishing world with a few hits. Something with deeper, more ineffable characters than are contained in Best Served Cold. In other words, taking a page out of his compatriot Patrick Rothfuss’s The Name of the Wind. But keep all the black humour in — and even intensify it. Ultimately, Best Served Cold is not a masterwork. By the end of the book, the potential of its characters for further development has more or less been played out, and at times they can be a little transparent. However, the book represents one of the best stand-alone fantasy novels to have been released over the past several years, and leads us to believe Abercrombie has that masterwork in him that will arrive some day soon.